Many rural electrification schemes have been completed up to year 2010 electrifying 85% of the total households in the island with funds received from lending agencies such as the Asian Development Bank, Kuwait Fund for Arab Economic Development, Swedish International Development Co-operation Agency and the Government of the People’s Republic of China. The Government of Sri Lanka attaches great importance to rural electrification with a vision to accelerate the work in order to achieve an electrification level goal of 100% by the year 2012. The rural electrification Project RE6 completed at a cost of Us Dollars 52 million with the assistance from the ADB envisages electrification of 707 full schemes and 2087 low voltage line extensions in all provinces of the country for socioeconomic development of the rural regions. About 141,000 consumers are been directly benefited by the project. The ADB provided US Dollars 6.5 million to carry out CAARP, an electrification project for the rehabilitation & expansion work of the Conflict Affected Areas of the North & East that was expected to benefit 12,000 households affected by civil unrest and disturbances.The total cost for the project is 18.5 million rupees. The NORAD provided a further grant of US Dollars 8.6 million for extension work under this project to provide electricity to 9,000 additional households. The work is nearing completion. The Swedish international Development Co-operation Agency has provided assistance to carry out the rural electrification project RE4 at a cost of US Dollars 36 million with the view of improving socio economic conditions of the rural regions together with poverty alleviation, human development & gender development. The work is being carried out by the CEB, and project would bring benefits in 218 schemes serving 34,300 new consumers. The project RE8 commencing in year 2010 is funded by the Islamic Republic of Iran to serve remote areas as well as un-electrified gap areas in between already electrified areas at a cost of US Dollars 108 million. About 1,000 schemes, which have been deprived of the facility of electricity in the past, are to be electrified together with low voltage network extensions in several existing schemes under the project. The project is expected to bring benefits to about 180,000 rural households. The project “Wadakkin Wasantham” was mainly proposed to supply electricity to whole Northern Province and to bring accelerated development to improve infrastructure in the areas of the north liberated after the war. 400 no of schemes are planned to implement with the cost of Rs.8000 million. The Lighting Sri Lanka –Hambantota District that was initiated by the government to provide electricity more than 68,000 beneficiaries in the underdeveloped regions of the district have been launched at a cost of 4,990 million. The project was designed to implement schemes within cost of Rs.250 million to benefit 2412 beneficiaries. The Lighting SriLanka – North Central Province project has been configured to serve the need of the rural people acutely in need of social & economic development in this district. The project was implementing 400 rural schemes with the cost of Rs 600 Million to benefit nearly 10500 customers. The project was extended with the purpose to achieve 100% electrification in North Western Province. For extension of the project Rs 8000 million was allocated to implement 550 more schemes. The main objective of the proposed Project is to provide electricity to about 30,000 rural households in Baticaloa and Trincomalee Districts in Eastern Province of Sri Lanka which has a lower electrification level of 67%. This figure for the Trincomalee and Baticoloa districts alone is 63%. The proposed Rural Electrification Project-Uva Province would serve the purpose of Rural Electrification Expansion & Access Improvement in the Uva province of Sri Lanka, will provide electricity to about 800 villages at an expected cost of about US $40 Million. The project will extend the Medium Voltage Distribution Lines by 625 km with 250 distribution substations that would feed 80,000 new households through a Low Voltage Network of 2,250 km meeting the requirements of Small & Medium Scale and Large Industries. The expansion of electricity under this program will be carried out needing immediate rural development in keeping with the policy of the Government where Rural Electrification is given priority under the National Distribution Expansion Plans of the Power Sector. Bids have been already been called for the material procurement of this project. The same has been evaluated and the tender has been awarded for the supply and delivery of the material. It is expected to receive the materials at the beginning of the year 2011. The main objective of the proposed Project is to provide electricity to 12,245rural households in the Eastern Province of Sri Lanka which has lowest electrification level of 67.3%. The total cost of the project is Rs 2,346 million. Remote villages are to be electrified through 486 new rural electrification (RE) schemes and MV switchgears are to be introduced for improving reliability of the system. 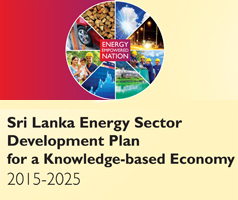 The “Pubudamu Wellassa” project was proposed to develop the electrification level of rural areas. Project scope includes 34.557 Km length of lines in the areas of Kataragama, Sevanagala and Thanamalwila with the cost of Rs. 33million to supply 673 beneficiaries. The Project Rural Household Connection will help to improve operational and financial efficiency in rural electrification and expand coverage of rural electrification for poverty reduction. The outcome of the project will be sustainable access to grid electricity by the rural population and a better service by CEB in rural areas. It is expected that at least 60,000 poor households will be connected to the grid. The Project would bring benefits as, the households themselves will enjoy the benefits to be derived from having access to electricity and CEB will have more customers, generating more income, and enabling progress toward the electrification targets set by the Government. An ADF loan of US$3.5 million will be provided for CEB to establish a line of credit. The project will require technical assistance of US$2.5 million, of which US$2.0 million will be financed by the Japan Special Fund and US$0.5 million by CEB. Main objective of the project proposal of SIDA extension was achieving 100% electrification level in North Central province with assistance of Swedish International Development Co-operation Agency. The work scope was proposed as 2000km of new Low Voltage Schemes, 2500 Km extensions of Low Voltage lines and 2000Km of single phase to three phase conversion Low Voltage lines.